The page before the stage, the page with the stage are to me a way to reach out, as well as an instrument of intellectual, thus political intervention. My writing gives voice to the little girl eager for History, the young woman who believed in change, the researcher with a strong interest in identity and imaginary constructions. History and imaginaries are the perimeter of my texts: inside are intimate voices. As Peter Handke put it: The innerworld of the outerworld of the innerworld. See below all the activities involving Alessandra Di Lernia in the frame of Fabulamundi. Alessandra Di Lernia is PhD in Islamic Culture. She radically changes her career moving to theatre as actor, author and acting coach. 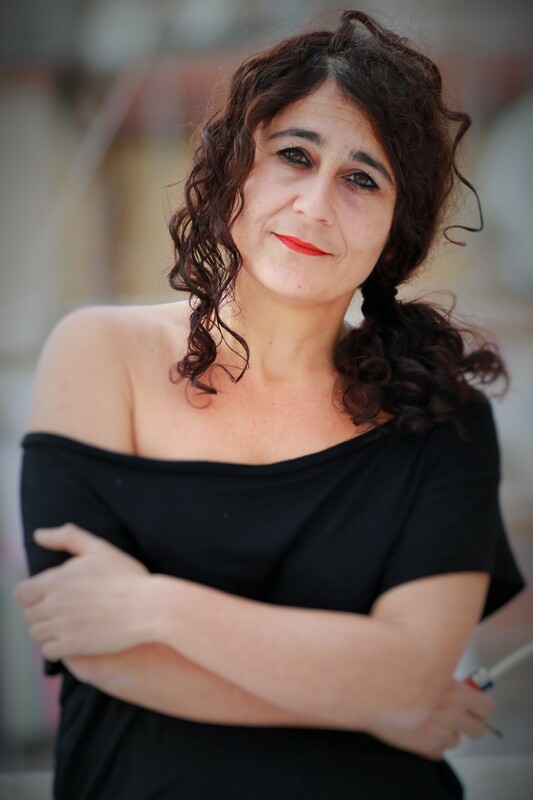 She is the author of col tempo, Il retro dei giorni, del sordo rumore delle dita, brought to the stage by the company Clinica Mammut that she co-funded and co-directed from 2012 to 2015. Co-creator of the project Melanconie in dedica a Pier Paolo Pasolini (2014), a series of performances inspired by Pasolini’s thought and Come essere felici già alle prime note dell’Inno alla gioia di Beethoven (2014), a work on the survival of racism in Italy’s post-colonial identity and P.P.P._melopèa alessandrina (2013), a cycle of artistic events and theoretical discourses on Pasolini. She teaches acting since 2011. In 2015 she signes the triptyque Attraverso un inverno (Dicembre_I fatti di gennaio e marzo_Il privilegio di febbraio). She is also a translator from French and Spanish. One. A young woman comes home to her elder sister, in her hometown. Like many others of her age, she lives abroad. One. It’s December, that stands for a homecoming and a gaze at the past. Outside, all around, Time cries events. Two. There come January and March, that hurt our consciences with their first attacks and umpteenth wars. Three. There is, at times, some personal event, a tad in History, but a violent inner strain so that History is left on the background, and time becomes slow, interior, almost still. It’s February. Attraverso un inverno is a triptyque. Its acts have specific content focus. The first act, Dicembre, starts with nowadays phenomenon of the increasing emigration of Italian young people, to question on the causes of a political surrender on change. I fatti di gennaio e marzo are triggered by the escalating loss of near-eastern cultural heritage due to the war that devastates that land and its population since 2011. Several themes are interwined in this act: the meaning of Cultural heritage, my long-lasting love for early Islam, and, as a mirror, Western identity with its historical responsibilities and current wounds both inflicted and suffered. The third act, Il privilegio di febbraio, focuses on the pharmacological cure of a melancholic condition caused by a professional debacle. History lies in the background, one can only hear an internalized, double voice. Dicembre opened with a character asking for a generic drug: “I would like a drug. Yes, a drug. I would like. I would like. Vorbei. Finished. Ended. What do you mean ended?”. The pharmacon returns to close the triptyque, in a concrete manner. Not a longed solution for a socio-cultural discomfort, but an actual remedy against a condition of inner pain. Dicembre, I fatti di gennaio e marzo, Il privilegio di febbraio only partially follow a temporal linearity.